This is not one of our traditional recipe reviews, we do from time to time create our own recipes and this is one of them. We came up with the idea for this recipe after visiting our local farmers market. Every Friday from May 25th to October 26th, rain or shine, the town of Goshen hosts the Goshen Farmers Market. It is located right in the center of town at 33 park place. The market usually consists of farmers and vendors offering fruits, produce, baked goods and much more (click here for more info). While perusing the produce two weeks ago we stumbled upon Madura Farms. They were selling an array of mushrooms such as giant portobellos, hen of the woods and oyster mushrooms. They were a bit expensive compared to traditional mushrooms, but they looked interesting and we decided to give them a try. We bought what we thought were oyster mushrooms but after we got home we realized that they were Hen of the Woods mushrooms. These two varieties are very similar in appearance. Even with the mushroom mix up, we sautéed them in oil and a splash of apple cider vinegar and they were amazing. We realized that they would be the perfect star in a simple pasta dish. 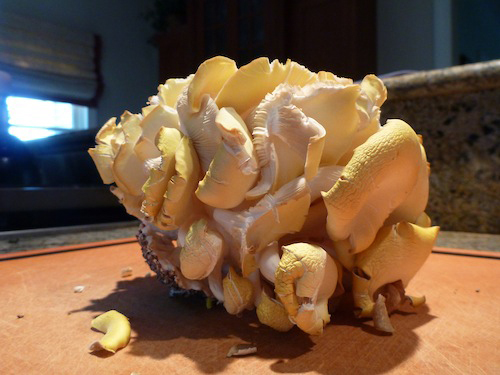 When last Friday rolled around we headed back to Madura Farms to buy more Hen of the Woods mushrooms. We were instantly disappointed to find out that they had sold out. Apparently some chef came by and scooped up all of the Hen of the Woods mushrooms. 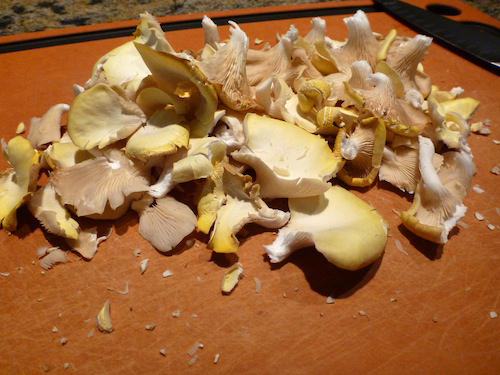 Fortunately they still had some yellow oyster mushrooms left and we decided that they would work just as well in the recipe we had envisioned. Both the Hen of the Woods and Oyster mushrooms have a distinct shape that in each case either resembles the frilly back feathers of hen or the shape of an oyster. They both have a strong earthy but sweet flavor that will stand out in any dish. It was the natural flavor of mushroom that convinced us that it would be the perfect topping for a fresh plate of pasta. We knew that these mushroom sauteed in butter and served over pasta would be the perfect pair. The only problem was that we had no actual recipe in mind and decided to wing it. To see how it turned out keep reading. Bring a pot of water to boil for pasta, be sure to season water with a decent amount of salt. Top with freshly chopped parsley and season with salt and black pepper to taste. Finish off each dish Pecorino Romano Cheese. With simple quality ingredients it is hard to make a bad meal. The mushrooms add a subtle but amazing earthy flavor to this dish, which is amazing considering they are competing with the intense flavors from the shallots and succulent flavor of the butter. The mushrooms are clearly the star of the dish followed closely behind by the fresh pasta. Fresh pasta simply makes any dish better, it is lighter than regular pasta and is the perfect choice for this type of sauce. 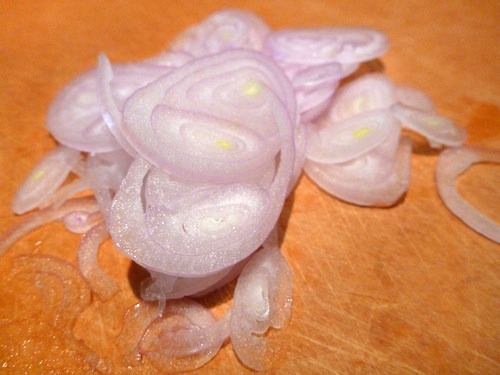 The shallots impart a nice onion/garlic flavor to the butter, which complements the flavor of the mushrooms. The parsley gives this dish a bit of color and a hint of freshness that is a nice counter point to the saltiness of the sauce and cheese. We only made enough for two bowls and were very upset to realize there were no seconds or leftovers. Next time we plan to make a double batch. This recipe creates a simple but flavorful dish that is easy and quick to make. All it requires is that you allow the natural flavors of the fresh ingredients to be the focal point of the dish. You are sure to wow anyone with this great combination of ingredients. The recipe is most certainly a Should Eat and we highly recommend visiting the Goshen Farmers Market to get your hands on some of these great mushrooms from Madura Farms. Be sure to also check out all of the other quality fruits, produce and hand crafted products available. We hope to do a post about the farmers market in the upcoming weeks, so be on the look out.